When I first met Yuki Beppu in Cambridge Massachusetts, she was a lovely, thoughtful and intelligent child at age 4. As she progressed quickly and with such precision through the ABCs of Violin books, I knew she was a genius at violin. I thought Yuki would benefit by entering New England Conservatory's Preparatory School where she would have regular master classes and recitals. She would also be able to study music theory, solfege, chamber music and play in the orchestras. Music schools have excellent courses and a wonderful atmosphere helping children reach their full potential. Violinist Kazuko Matsusaka of the Boston Symphony was on the faculty of NEC. After contacting her, we agreed to meet at Symphony Hall where Yuki auditioned for her. Yuki's parents attended the audition. Yuki played extremely well and impressed Ms. Matsusaka very much. She played pieces, exercises and scales from The ABCs of Violin for the Advanced, Book 3. Before moving on to Ms. Matsusaka, Yuki was learning Fiddle Study with me. This is a piece I had written for The ABCs of Violin for the More Advanced, Book 4. I was happy to see that Yuki continued studying this piece with Ms. Matsusaka and played it at her first NEC recital. In May of 2007 I attended a full recital given by Yuki Beppu. She was age 10. I was thrilled to hear Yuki play very advanced repertoire with superb technique and artistic phrasing. 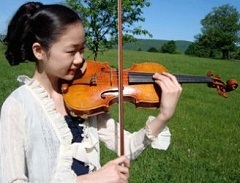 In November of 2007 Yuki won the NEC solo competition playing the entire Wieniawski Violin Concerto in D minor. She played this solo with an NEC orchestra in spring 2008 to critical acclaim. Yuki also performed on The ABCs of Violin for the Intermediate Player DVD published in 2008. She had turned age 11 one week before the filming. I had the good fortune to study eight years with Eric Rosenblith, protégé of Carl Flesch, in the NEC Preparatory School and College. I am very happy Yuki studied with him as well, and continues to have wonderful experiences at NEC and beyond. 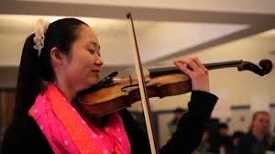 Her violin teachers were Kazuko Matsusaka, Joseph Silverstein, Julianne Lee, and Donald Weilerstein. Yuki began attending The Juilliard School in New York City, Fall 2015! Yuki won numerous awards along with winning the NEC solo competition. Yuki performed at Governor Deval Patrick’s Inauguration Gala. Cellist Yo-Yo Ma and violinist Lynn Chang also performed at the event. Yuki studied with Eric Rosenblith and Joseph Silverstein. Her NEC chamber music group Trio Con Brio appeared on the National Public Radio program From the Top with host Christopher O'Riley. Her performances had excellent newspaper reviews, one titled Amazing Grace, Amazing Prodigy. 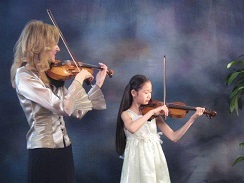 Yuki was filmed in The ABCs of Violin for the Intermediate Player DVD. She performed all 69 pieces from the ABCs of Violin Books 1 and 2. Yuki played for President Obama at Hynes Convention Center in Boston, Massachusetts on October 16. Yuki continues to study with Kazuko Matsusaka and Julliane Lee of the BSO, and Joseph Silverstein. Yuki played Mozart's Concerto No.5 with the Lexington Symphony in Massachusetts. Yuki played a full recital in Japan with an audience of 400 people. She was critiqued in Japanese newspapers. Yuki performed Lalo's Symphonie Espagnole and Meditation from Thais with the Waltham Symphony on Sunday, March 13 at 3pm. Yuki played Vieuxtemps Concerto No.5 with the Salem Philharmonic Orchestra on Sunday, January 8 at 3:30pm. Conductor Emeritus Alan Hawryluk was Janice Tucker Rhoda's first violin teacher. Yuki played a Solo Recital at Reading Public Library on Sunday, January 22. Yuki played Meditation from Thais with NEC's orchestra in Jordan Hall on Sunday, January 29. Yuki played Vieuxtemps Concerto No.5 with the Waltham Symphony on Sunday, March 4 at 3pm. Yuki played a Solo Recital at Ishikawa Ongakudo Concert Hall. She played 4 recitals in Japan, summer of 2012. Yuki played Meditation from Thais with harpist Sarah Kawai for the Boston Harp Festival on Saturday, September 29. Yuki played a solo with the Boston Philharmonic and conductor Benjamin Zander, Saturday, April 27, 2013. Yuki played The Lark Ascending by Ralph Vaughan Williams with the Lexington Symphony, Saturday, June 8, 2013. Yuki played Ysayë Ballade No. 3. on the show, From The Top, at Jordan Hall in Boston, Sunday, October 6, 2013 at 2:00 to 3:30pm. *It was aired on From The Top's website, Monday, November 18. *It was aired Sunday, November 24 at 7:00pm on 99.5, Classical New England. Yuki played the Tchaikovsky Violin Concerto with the Reading Symphony and conductor Roland Vazquez on Sunday, November 17, 2013 at 3:30pm. Yuki played a Bach Trio Sonata with oboist Peggy Pearson on Sunday, November 25th, 2013 at a Windsor Concert. Yuki played in New York for the staff of TV news channel MSNBC on December 14, 2013. Yuki played for a Bank of America US Trust Event at the Museum of Fine Arts in Boston for From the Top on February 24, 2014. Classical Violinist Yuki Beppu plays Lady Gaga! Yuki played on Good Morning America Thursday May 1st at 7:30am! YUKI on Good Morning America 2014! Yuki played the Tchaikovsky Violin Concerto with the Massachusetts Youth Symphony Project. Babson College on Sunday, May 18th at 4:00pm. Yuki played at the Cueball Annual Dinner organized by Brian Rafanelli in South Boston, MA on Tuesday, June 17. Yuki appeared on From the Top in Salem, MA in collaboration with composer Matthew Aucoin on Sunday, June 29. She performed his original composition, Celan Fragments. Yuki performed with the Piano Guys at Wang Theater in Boston, MA on Tuesday, December 9th at 7:30pm. Yuki played the Prokofiev Violin Concerto No. 1 in D Major, 2nd movement with Boston Philharmonic Youth Orchestra and conductor Benjamin Zander in Sanders Theater, Cambridge, MA on Sunday, February 1st at 3:00pm. Yuki performed a Solo Recital at the Brookline Public Library, Brookline, MA on Sunday, February 8th at 2:30pm. Yuki performed Prokofiev Violin Concerto No. 1 in D Major with the Nashua Chamber Orchestra and conductor David Feltner on Saturday, June 6th at 7:30pm at Nashua Community College, and Sunday, June 7th at 7:30pm at Milford Town Hall in Nashua, NH. Yuki was accepted at The Juilliard School in New York City, and began her freshman year in Fall, 2015! Her violin teacher is Ronald Copes. Yuki attended The Juilliard School as a sophomore. 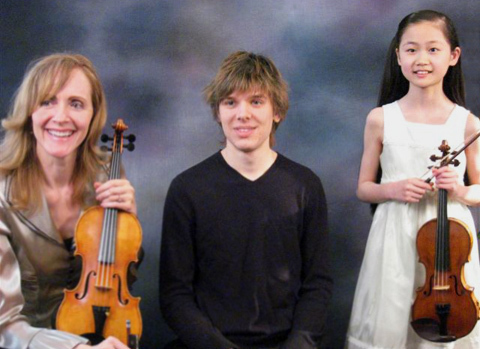 Yuki attended Kneisel Hall Chamber Music School & Festival. Yuki is attending The Juilliard School as a Junior in the Fall. Yuki on YouTube playing Bach's E Major Preludio for the President. Yuki on YouTube playing Meditation from Thais with pianist George Li. Yuki on YouTube playing Paganini Caprice No. 5 and Meditation from Thais in Japan. Yuki on YouTube playing Rock n' Roll Study from ABCs of Violin Book 2. Yuki stars in ABCs of Violin for the Intermediate Player DVD and plays on the MP3s of ABCs of Violin for the Intermediate, Book 2.